Padula is a fine off the beaten track destination in Campania. Padula lies on the border of the Cilento National Park in Campania, and features Italy's second largest Carthusian monastery, or charterhouse, after the Charterhouse of Parma. How big is it? Well, it's spread out over 12.7 acres and includes 320 rooms and halls. Padula was an interesting and powerful place in Southern Italy. The town sits high on the hill, while the Certosa is on the flatlands of the Vallo di Diano, a natural crossroads for early civilizations. The Provincial Archaeological Museum of Western Lucania in Padula is a recommended visit. The National park of the Cilento and Valley of Diano includes a huge swath of Campania, from the Mediterranean to the interior Vallo di Diano. Padula sits on its eastern edge, and like many larger villages here, can be called "the gateway to the Cilento." A drive through the valley in sprintime can be spectacular and full of wildflower color. Zoom out from the map above to see the layout of the Cilento and Vallo di Diano. The Greco-Roman city of Paestum is located in the north of the Cilento near the coast. 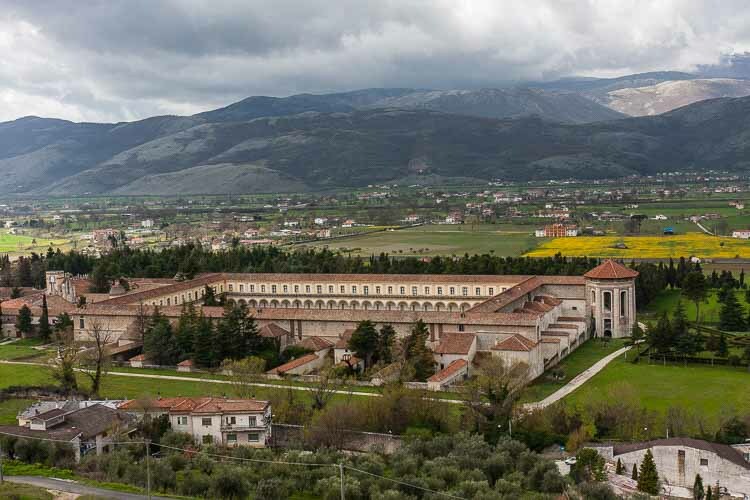 Also part of the world heritage site that includes the Certosa di Padula, it's worth a visit if you're in the area. Just north on the A3 Autostrada are the Pertosa Caves. There's a lake inside that allows you to slowly drift in a boat while you gawk at the mineral formations. A visit takes a couple of hours and the cave is very cool, just in case you want to escape the heat of summer in Southern Italy. Marked on the map is our favorite hotel, the Hotel Villa Cosilinvm. It has a fine, intimate restaurant located under the hotel, where you'll find archaeological remains. The wine comes from the family that owns the hotel--and it's very good wine. Highly recommended. The Grand Hotel Certosa is another interesting place to stay near the charterhouse. It's "value luxury" you might enjoy. For other Lodging options, check out the booking box below. Looking for places to go in Italy? We have some on a big, free map. Train tracks lead to many interesting destinations in Italy and other countries. Copyright © 2017 - 2019 · All Rights Reserved · Mapping Europe. Page modified: March 21 2019.